Fire chief Brian Scott speaks at a Tuesday community outreach meeting. The Evanston Fire Department is considering implementing a mobile healthcare program and using drones in future operations. The Evanston Fire Department announced at a Tuesday meeting that it is considering the implementation of mobile healthcare as part of its community outreach program. 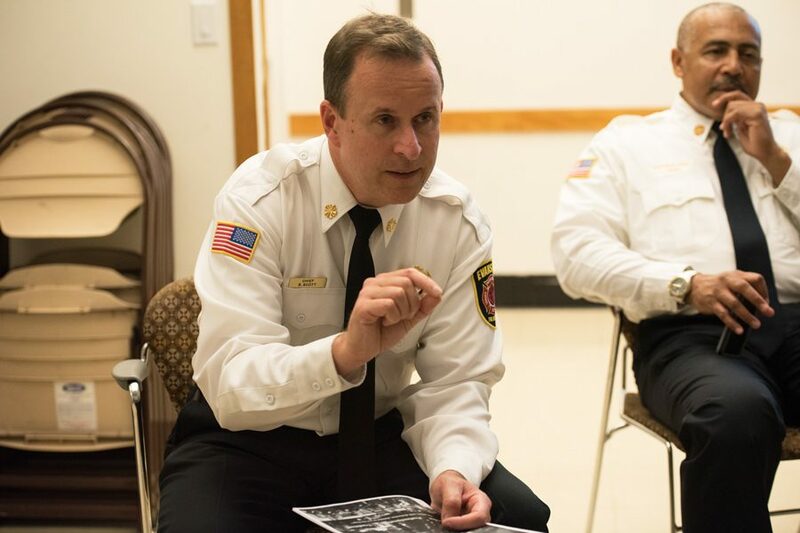 In its first ever community meeting, the fire department sought input from Evanston residents for a review of their 2014 strategic plan, which remains in effect until 2020. Division chief Paul Polep said though EFD primarily interacts with community members “at their worst moments,” the department is trying to expand its outreach. But four fire department officials were greeted Tuesday night by an empty room at the Levy Senior Center. In a discussion of their strategic plan, fire chief Brian Scott said the department was considering investing in a “cutting edge” mobile integrated healthcare program to Evanston. EFD currently receives calls from residents who want to visit the hospital because “they have a cold” or are “just not feeling right,” Polep said. These residents are taken to the hospital and can face thousands of dollars in ambulance fees. The mobile healthcare program would allow residents to be treated in their own home instead of at the hospital. Under the new model, a nurse practitioner or physician assistant capable of making diagnoses and writing prescriptions would be sent to the patient’s home. This program could also be used by residents who suffer from serious illnesses like diabetes. “If we can have that mobile-integrated healthcare team just touching bases with them on a weekly basis — checking in on their medication, making sure they have what they need — that goes a long way for them having to call 911 in a crisis situation,” Scott said. The mobile physician assistants and nurse practitioners would be provided by Presence Saint Francis Hospital and NorthShore University HealthSystem. Scott said he looked to the Rockford Fire Department for inspiration after it implemented the program in 2014 through a partnership with SwedishAmerican. The fire department saw a 54 percent decrease in emergency department visits, a 38 percent drop in ambulance runs and a 28 percent reduction in hospital admissions by patients enrolled in the program. The department’s goals extend beyond the mobile healthcare program. Scott said he also foresees the potential use of drones in future operations. Scott, himself a recreational drone owner, said the drones could be used for extended operations including lakefront rescues and surveillance of buildings damaged by large disasters. He said he is waiting for the technology to become more durable before bringing drones to the department. There will be two more community meetings on Nov. 4 and Nov. 15 where residents will have the opportunity to provide feedback regarding the strategic plan, Scott said. There is also an online survey where residents can express their expectations for the department. Correction: A previous version of this story misstated the department for the officials presenting at the Levy Senior Center. They were Evanston Fire Department officials. The Daily regrets the error.